From Kuhn Rikon comes this innovative plastic can opener. Opening cans can be dangerous when you're left with sharp edges on the can and the lid. With the Safety Lid Lifter Can Opener, you'll eliminate these potential kitchen hazards by removing the lid completely without ever having to touch it. The cutter removes the top portion of the lid just below the rim of the can, and an exclusive lid gripper lifts the lid off completely. 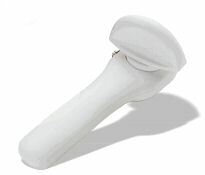 The soft handled turning knob allows for both right and left handed use. You won't have to ever slice your fingers to the bone again on razor sharp can lids.